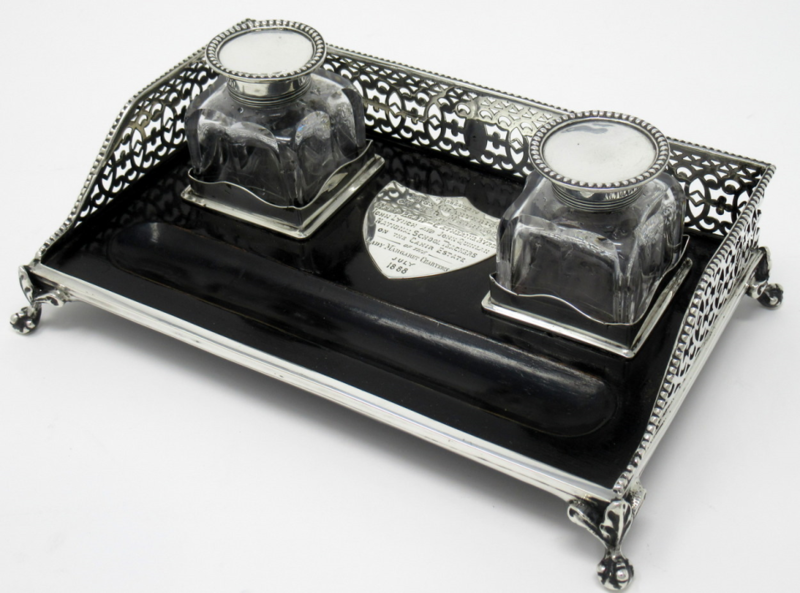 Superb Sterling Silver & Ebony Twin Bottle Inkstand of outstanding quality and compact proportions with interesting shield shaped plaque of Irish Interest. 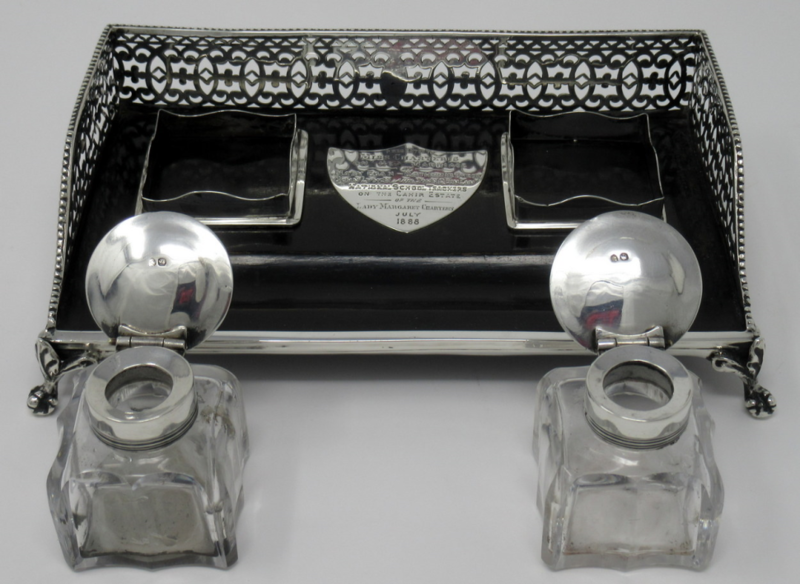 The original pair of crystal ink bottles with silver hinged lids with beaded rims sit on a rectangular ebony base surrounded by a stylish fret cut silver gallery, all raised on four miniature ball and claw supports. Makers Mark is indistinct. 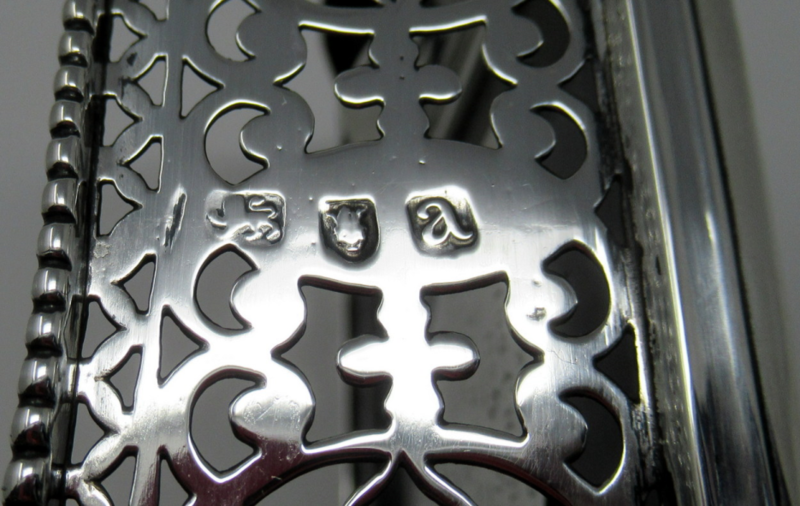 London assay mark. Condition: Good condition with some tiny dents. Professionally polished. 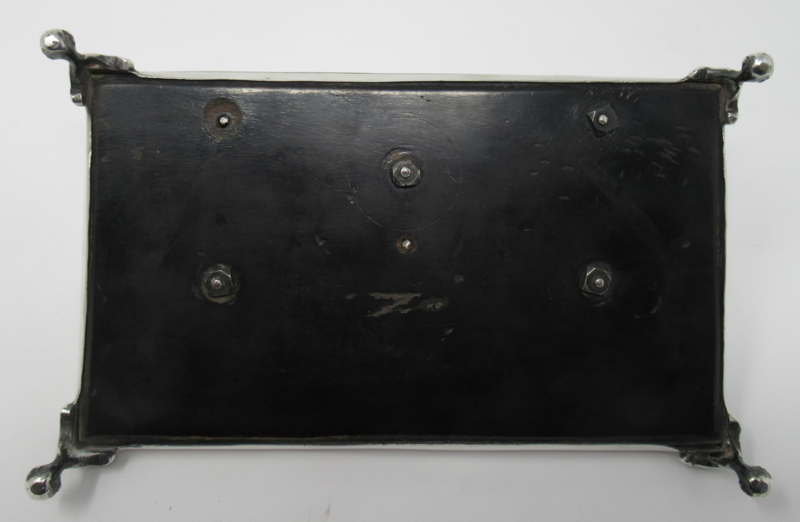 Width: 8.25” (21cm). 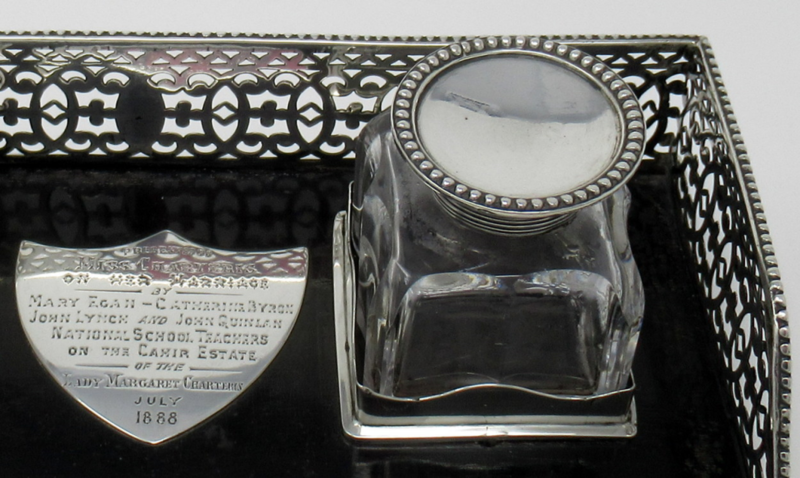 Depth: 5" (12.75cm). 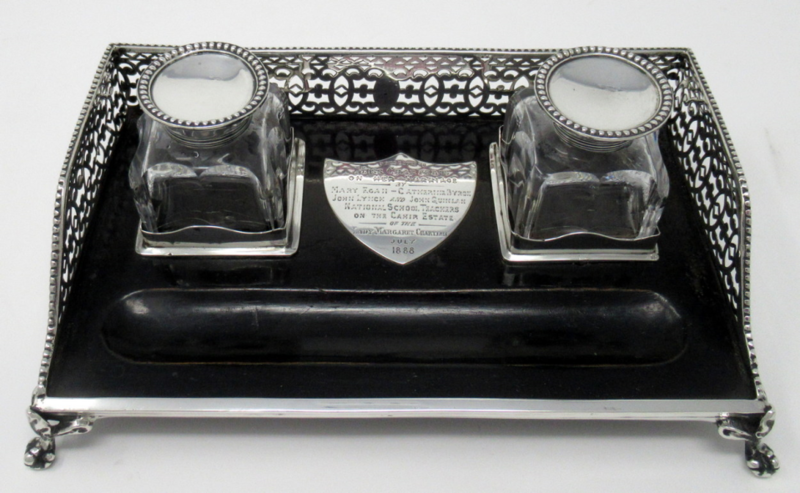 Height: (at back) 2.25" (5.5cm). 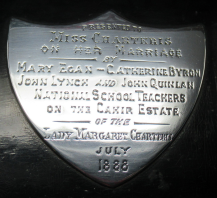 Plaque Reads: "Presented to Miss Charteris on her Marriage by Mary Egan – Carherine Byron, John Lynch and John Quinlan. 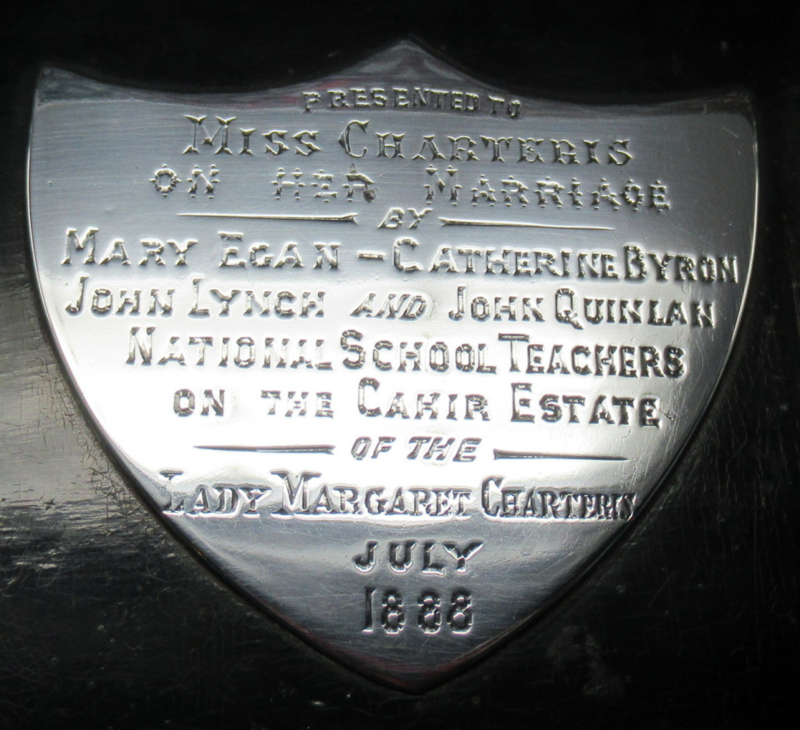 National School Teachers on the Cahir Estate of the Lady Margaret Charteris. July 1888." Lady Margaret Charteris was the eldest daughter of Richard Butler, 2nd and last Earl of Glengall. 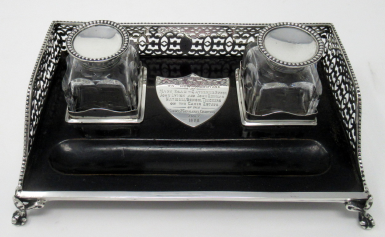 She inherited her father's extensive estate at Cahir, County Tipperary in Ireland, following his death in 1858. In that year she married the Honourable Richard Charteris, second son of the 8th Earl of Wemyss and March. She built Cahir Park as the family home in the locality and in the 1870s owned 16,616 acres in County Tipperary. She was succeeded by her eldest son, Richard Butler Charteris, who continued to live at Cahir until his death in the mid 20th century. In May 1859 an estate of 12,369 acres belonging to Lady Margaret Charteris, Lady Matilda Butler and the trustees of the Glengall Estates in counties Tipperary and Waterford was advertised for sale. In May 1872 almost 1,000 acres in the County Tipperary Barony of Iffa and Offa West was advertised for sale by the trustees of the marriage settlement of Richard and Lady Margaret Charteris. The latter property was sold in January 1873. The purchaser was W. Lane who bought over 900 acres.